Welcome to the tasty world of OttoWaffle. 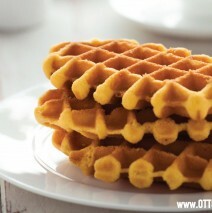 Its irresistible flavour makes this waffle perfect for a quick snack or to satisfy a craving. To take home or to eat on the spot, it has the power to awaken all your senses, from smell to taste. It is exactly what any connoisseur’s palate could hope for, something to be savoured without the least hesitation. The recipe seems very simple, but the exact proportions and precise knowhow are not within the reach of all. Ottowaffle dough is sold in balls made using only natural ingredients of plant origin. The quality of its ingredients and their traceability are impeccable, as is the strict respect for European hygiene and safety standards. Clever mixtures and procedures for dough with an incredible texture, hand worked with such precision and handling that it is bound to produce waffles packed with explosive flavours.